Did you know that your zip code can be a predictor of your health? So can your place of birth, where you work and play, your income and education, and a host of other factors -- in addition to the choices you make each day about what to eat. These factors, what public health professionals recognize as "social determinants of health," are linked to the inequities in health and health care (health disparities), among racial and ethnic minorities in America. During National Minority Health Month each April, the U.S. Department of Health and Human Services (HHS) Office of Minority Health (OMH) leads the nation in raising awareness about these disparities, their causes and the impact they have on minority communities and on the nation as whole. The theme of this year's National Minority Health Month observance -- Accelerating Health Equity for the Nation -- reflects both a sense of urgency and a sense of determination in moving the country forward toward health equity. Nutrition plays a major role in advancing health equity. Dairy foods such as milk, cheese, and yogurt can be key in decreasing the nutrient intake disparity faced by the African American community. Dairy foods can deliver many nutrients important for good health, including three of the nutrients of public health concern -- calcium, potassium, and vitamin D. Health authorities such as the National Medical Association (NMA) - the nation's oldest and largest organization of African-American physicians -- and the National Hispanic Medical Association (NHMA), as well as the 2015 Dietary Guidelines for Americans all recommend, for most, three servings of low fat or nonfat dairy as a means of closing the nutrient intake gap. It's not surprising that NMA and NHMA have addressed this public health concern. In fact, the 2015 Dietary Guidelines Advisory Committee report states "consumption of dairy foods provide numerous health benefits, including lower risk of diabetes, metabolic syndrome, cardiovascular disease and obesity" -- disease states affecting African Americans at disproportionate rates. This evidence makes a strong case for the inclusion of dairy in your diet. While very few populations adhere to the current Dietary Guidelines for Americans (DGAs) recommendation of three servings per day of low fat or nonfat dairy, African Americans unfortunately, tend to show the greatest gaps between daily recommended intakes and actual intakes of key food groups and the nutrients of public health concern. That's because the DGAs can be challenging for people of color who are lactose intolerant or suffer from lactose maldigestion. Lactose intolerance -- whether real or perceived -- is a major health concern. Research shows that 75 percent of African Americans have lactose maldigestion, compared to 60 percent of Hispanic Americans and 20 percent of non-Hispanic whites . Even in cases where there is no definitive diagnosis, many African Americans believe they are lactose intolerant and modify their diets accordingly -- often eliminating a great deal of their dairy intake and thus, the nutritional benefits that come from eating dairy foods . For those who perceive themselves to be lactose intolerant, milk avoidance is a major obstacle in obtaining adequate calcium and vitamin D from the diet, and it has been shown that avoiding dairy may lead to shortfalls in essential nutrients . Because of this nutritional shortfall, the National Institutes of Health identified self-restriction of dairy foods associated with self-diagnosis of lactose intolerance as a public health problem . Most people don't know that yogurt can be a more easily digestible alternative to milk because it can contain live and active cultures that help with lactose digestion. Additionally, yogurt, on average, contains less lactose per serving than milk and may allow more people to enjoy dairy products with fewer associated symptoms . Yogurt is a great example of a nutrient dense food option. Most yogurts provide calcium, potassium, and vitamin D and eating yogurt regularly is associated with less weight gain over time [6,7]. Yogurt can also be an excellent source of high quality protein, and together with calcium and vitamin D helps promote bone and muscle strength . According to the American Diabetes Association, plain nonfat yogurt with no added sugar can be a good choice if you have diabetes. It is convenient, portable and versatile and can be enjoyed by all ages. Yogurt can also help you eat other nutrient dense foods like fruits and vegetables through pairing and yogurt-based dips and dressings. 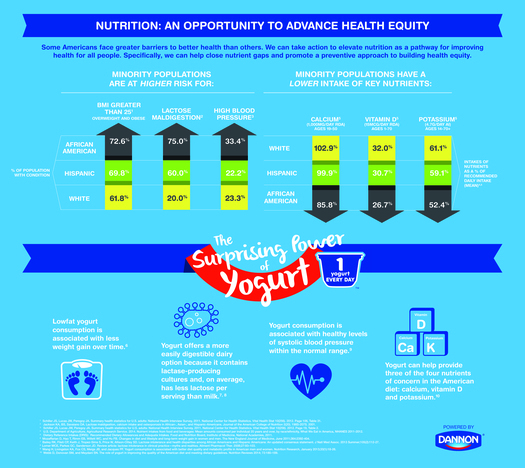 This "Nutrition: An Opportunity to Advance Health Equity" infographic below shows how yogurt can help close nutrient gaps, such as those that may be caused by lactose intolerance, and promote a preventive approach to building health equity. So, in the spirit of this year's National Minority Health Month theme, Accelerating Health Equity for the Nation, I encourage you to take action for health equity. Use the following strategies and enjoy all the health benefits of dairy. Add 1 cup Greek nonfat yogurt to 2 lbs. mashed potatoes in place of 4 Tbsp. butter. Replace Greek nonfat yogurt for sour cream, cup for cup, in your favorite muffin or coffee cake recipes. Use the same amount of yogurt in place of oil in marinades for chicken, fish or pork before grilling for a tangy flavor. Use 1 Tbsp. Greek nonfat yogurt per serving instead of 1 Tbsp. sour cream to garnish bean soups or chili. Try Greek nonfat yogurt in place of butter on bagels or muffins. Replace mayo with Greek nonfat yogurt in your chicken salad. Indulge your sweet tooth with this wonderful Pumpkin Chocolate Yogurt. 1. Jackson KA and Savaiano DA. Lactose Maldigestion, Calcium Intake and Osteoporosis in African-, Asian-, and Hispanic-Americans, Journal of the American College of Nutrition, 2001;20:2, 198S-207S, DOI: 10.1080/07315724.2001.10719032. 2. Bailey, R.K.; Fileti, C.P. ; Keith, J.; Tropez-Sims, S.; Price, W.; llison-Otte, S.D. Lactose intolerance and health disparities among African Americans and Hispanic Americans: An updated consensus statement. J. Natl. Med. Assoc. 2013, 105, 112-127.
assessed by meta-analysis: a grain of truth that leads to exaggeration. J Nutr. 2006;136:1107-13. 4. Wilt, T.J.; Shaukat, A.; Shamiliyan, T.; Taylor, B.C. ; MacDonald, R.; Tacklind, J.; Rutks, I.; Schwarzenberg, S.J. ; Robert, L.K. ; Michael, L. Lactose intolerance and health. Evid. Rep. Technol. Assess. 2010, 192, 1-410. 5. Lomer MCE, Parkes GC, Sanderson JD. Review article: lactose intolerance in clinical practice--myths and realities. Aliment Pharmacol Ther. 2008;27:93-103. 6. Mozaffarian D, Hao T, Rimm EB, Willett WC, and Hu FB. Changes in diet and lifestyle and long-term weight gain in women and men. The New England Journal of Medicine, June 2011;364:2392-404. 7. Webb D, Donovan SM, and Meydani SN. The role of yogurt in improving the quality of the American diet and meeting dietary guidelines. Nutrition Reviews 2014; 72:180-189. 8. Robert P Heaney and Donald K Layman. Amount and type of protein influences bone health Am J Clin Nutr May 2008 vol. 87 no. 5 1567S-1570S.